Clouds loomed. It looked like rain. So I went to bring in the floor runners I had left in the sun earlier. In the periphery of my vision something flashed past. A bird! I was sure it was a bird and a new one at that. True I had not had a direct look at it, but its flight had appeared different from those of the regulars in my neighborhood. Yup, I am pretty good with my peripheral vision. I have found I am always the first one to let out a shriek if a mouse has entered the room while others are like, ‘Mouse? What mouse? Stop imagining things!” only to eat their words a few minutes later. But I digress. I ran inside, dropped the runner next to the cot, grabbed the camera and ran back. Not that I had much hope of finding it. There are a lot of trees in the vicinity and the bird could by then have ensconced itself anywhere, away from prying human eyes and also intrusive camera lens. 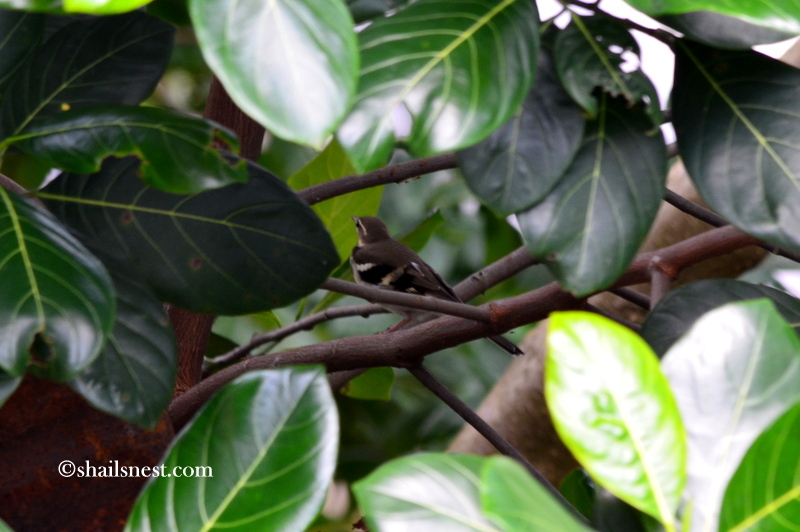 As luck would have it, it didn’t take me long to spot the bird through a gap in the leaves of the jack-fruit tree. It was looking the other way, away from me. Even as I took aim for a better shot, it flew off to a different tree to the right side of the house. I was not about to give up though it was already lunch time and I was terribly hungry. So I climbed the steps leading to the terrace and stood scanning the surroundings. All I could see was the ever reliable Loten’s Sunbird, jumping hither and thither, hovering, knocking at my window below, not knowing I had a perfect view of its antics. As if suddenly aware of my eyes, it quickly and prettily jumped back on to the orange flower of the thickly growing bush and looked up, giving a perfect pose. Obligingly I took a few pictures. The hunger pangs were getting stronger. Besides I could hear the L & M calling. This meant Luci was bound to come running. She thinks it is her duty to herd me downstairs if she hears him calling me. I’d better go downstairs, I thought. It looked like the *new* bird had vanished. For all I knew it could still be right under my nose, well camouflaged. And how right I was. 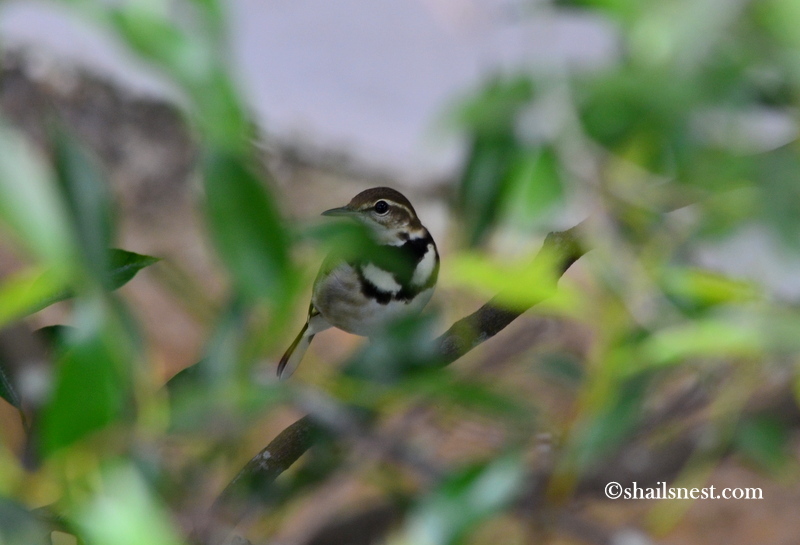 I saw it a moment later, through the leaves of an unknown tree in my neighbor’s garden. The bird looked up startled at the first click, turned this way and that and then dashed away. I had at least got a few decent shots by then. That is so exciting to be able to see a bird like that. Even forest creatures, like Snow White, find her alluring!